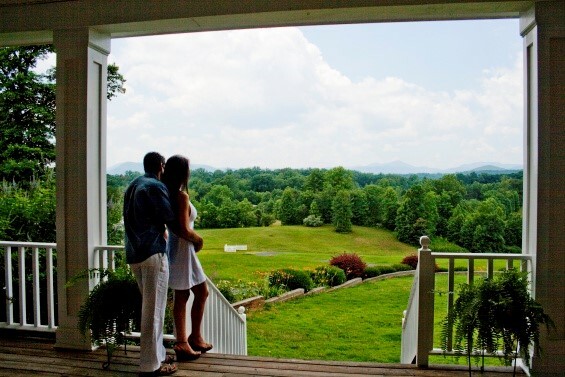 Surrounded by idyllic countryside in the foothills of the Blue Ridge Mountains is the Dahlonega Spa Resort. This sister property to Costa Rica’s famed Pura Vida Retreat and Spa is nestled on 72 acres near the historic gold-rush town of Dahlonega, Georgia. Located just over an hour and a half north of Atlanta, this legendary spa is a private and sophisticated enclave for frazzled suburbanites and yoga enthusiasts. One of the first things you notice when you pull up to the entrance of this tranquil mountain hideaway is the wide arc of blooms that sweeps across a meticulously groomed landscape. Complementing this manicured tapestry of color is the sound of the trickling waters of Meditation Pond. The welcoming scene sets a mood that is simultaneously reenergizing and calming. Very Feng Shui. There are 23 guest rooms in all, each with a private bath and walk-in shower. All are tastefully and comfortably decorated in high country style. Guests have their choice of three styles of accommodations, including Farmhouse rooms, cabins and suites. The Farmhouse rooms are part of the large main house. Cabins are each their own separate structure and provide more space, a refrigerator, coffee maker and privacy and seclusion. Suites offers living, sitting, dining and sleeping accommodations. The main house is a reproduction 1920-style Farmhouse with a wraparound porch that provides spectacular views of the Chattahoochee National Forest and beyond. While the front porch with rocking chairs transports you back to an earlier era, the property is actually less than a decade old. The Dahlonega Spa Resort is all about healthy indulgence and taking care of oneself. Relaxation, pampering, fresh mountain air, organic food, solitude, comfort and privacy are the key words here. There are no televisions, no phones, just you, your loved ones and nature. The meals are home cooked using herbs from the garden n the property, mostly vegetarian and often featuring world cuisines. Afternoon and nighttime cravings are satisfied with a well-stocked bar area with beverages, homemade cookies and other treats. Guests can also enjoy a glass of regional wine from the area’s wineries or microbrewed beer to cap off a day of yoga classes. The yoga classes can range from very basic to customized private ones, but typically accommodate all levels of proficiency. When extra pampering is desired with your yoga experience, the state-of-the-art spa offers a full menu of services including the signature Botanical Mud Wrap and Organic Hot Stone Massage. I experienced the best deep tissue massage I have ever had here. When I arrived at the Dahlonega Spa Resort, I had just spent four days hiking the famed Appalachian Trail with a twenty-five pound backpack. I had aching muscles in places that I didn’t even know existed! As I hobbled over to the spa, I wondered if I would find any relief. After an hour long massage, I was a whole new person with absolutely no trace of muscle soreness. After the massage, I could have easily hiked another few days on the trail. While many people enjoy the seclusion and privacy of the Dahlonega Spa Resort and choose to never leave the property during their stay, the resort is a great starting point for all kinds of activities. The surrounding area is a Mecca for the outdoor enthusiast with state and national parks, hiking trails, cycling, horseback riding, tubing and fishing nearby. With the stock markets crumbling, world-wide unrest and negative news headlines in most papers, there is not much you can do to change the state of the world, but you can change the state of your mind and body by spending a couple of days relaxing at a spa. The owners of the Dahlonega Spa Resort have operated wellness and spa resorts in three countries for more than 30 years. Let them pamper you on your next getaway. Reservations are recommended. For more information, call (866) 345-4900 or visit www.dahlonegasparesort.com.